This photograph arrived to the Archive already titled, however the whole story was revealed following three contacts from George Tremain. He told the Archive:”The older Charles Hall was my great, great grandfather and Margaret Elizabeth my great, great grandmother”. 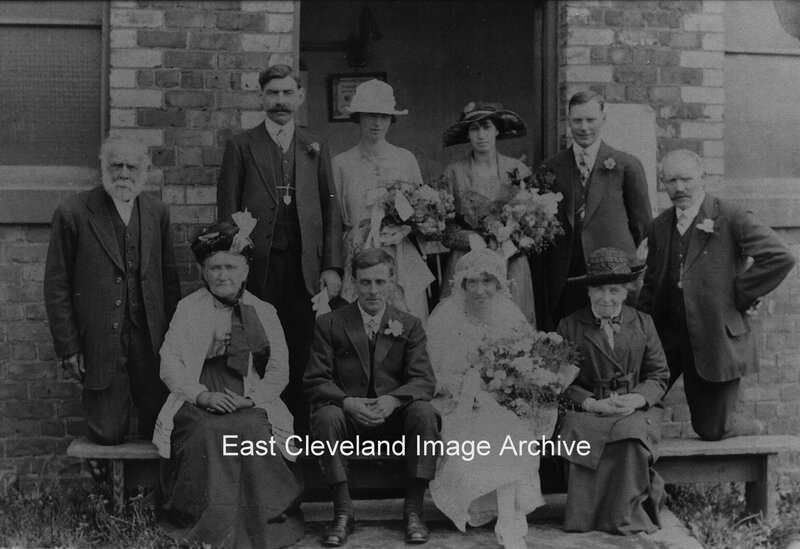 George then assisted with: “This photograph shows the wedding between Charles Hall of Front Street, Carlin How to Olive Appleby; also of Carlin How. They were my great grand parents. The wedding took place in 1920, Charles was 30 years of age and Olive was also 30 years. Also on the left of the photograph is his father Charles Hall who had been an Overman in the Loftus Ironstone Mine who was aged 76 years at the time of the photograph and his wife Margaret Elizabeth Ann (nee Ord). The parents of the bride were William and Mary Appleby.” George added even more information about the Hall family with: “An ancestor of mine called Charles Hall married Margaret Elizabeth Ord on 18th June 1870 at Brotton Parish Church. He was an ironstone miner who later became an Overman at the Loftus Ironstone mine. He lived in 2 Carlin How lodge and later at 6 Overman’s Cottages. He had a son also called Charles Hall born in 1887 so it could possibly be his marriage if not his father’s”. Tony Nicholson also advises: “If I’m not mistaken, the chap standing at the back with the impressive moustache is Tom Petty. He and my grandfather, Fred Nicholson. set up in business together (Nicholson & Petty), first in Carlin How and then Brotton. By the look of it, Tom may well have been best man at Charles’s wedding. It certainly fits, because my grandfather was brother-in-law to Charles. They were all chapel people and this shows them standing outside Zion Chapel, Carlin How”. Image courtesy of Carlin How Community Centre, thanks to George Tremain for confirmatory information on Charles Hall and the family; also thanks to Tony Nicholson fro the update. If I’m not mistaken, the chap standing at the back with the impressive moustache is Tom Petty. He and my grandfather, Fred Nicholson. set up in business together (Nicholson & Petty), first in Carlin How and then Brotton. By the look of it, Tom may well have been best man at Charles’s wedding. It certainly fits, because my grandfather was brother-in-law to Charles. They were all chapel people and this shows them standing outside Zion Chapel, Carlin How.